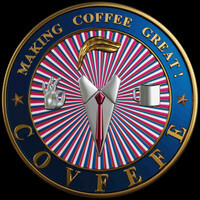 Framed poster - COVFEFE: Making Coffee Great! Make a statement in any room with this framed poster, printed on thick, durable, matte paper. The matte black frame adds an extra touch of class. • Alder, Semi-hardwood frame • Black in color • .75” thick • Acrylite front protector • Lightweight • Hanging hardware included - COVFEFE!